I've sung the praises of NavPress before, citing the design savvy apparent in several editions of The Message Remix, and now I have to do it again. Like every publisher, NavPress turns out its fair share of tasteless kitsch, but every so often they show that with a little aesthetic know-how, inexpensive materials can be shaped into a superb finished product. 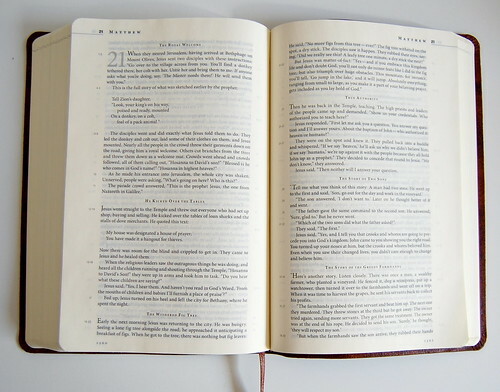 The latest example of this is the new Personal Size Numbered Edition of The Message. The Message, of course, is a popular paraphrase of Scripture by Eugene Peterson. I love Peterson's writing and have gained a great deal from him over the years, but I'm not a big fan of the paraphrase. It doesn't "speak to me," I guess you could say. So why is it the first option I investigate every time I'm in the bookstore? Because NavPress has done a great job of designing outside the box. The Message Remix hardback, for example, is a great, reader-friendly format that's become a bit of a postmodern classic. 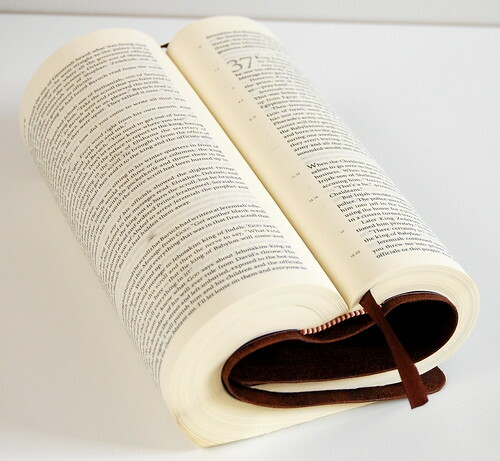 If The Message is a paraphrase of Scripture, the Personal Size Numbered Edition is a paraphrase of the traditional leather Bible. The parts are all there, more or less, but they've been refreshed with a dose of design sense. The edition pictured here is bound in a flexible "leather look" cover that resembles a Hollywood costumer's take on a WWII bomber jacket. A single brown ribbon complements the color. 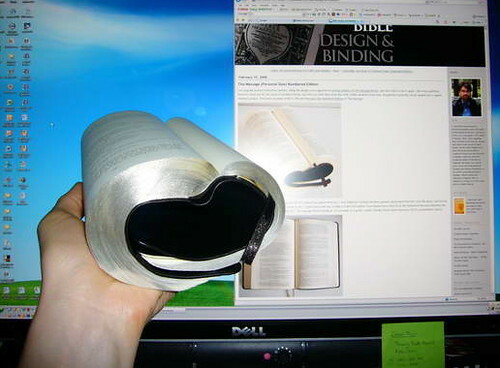 The text block, printed on cream-colored paper, shifts like liquid in your hand. It's not very opaque -- there's plenty of bleed-through -- but it feels good when you handle it. I purchased this edition from Amazon for $20 after passing up the tackier covers with inset photos available at the bookstore. But the Personal Size Numbered Edition doesn't feel like a $20 book. This thing punches above its weight. The layout is single column, with poetry set in verse. As with the hardback I reviewed before, the verse numbers are placed in the margin where they don't interrupt the flow of the text. The designers fixed one of the big problems with the hardback, though -- they increased the size of the inner margins (the "gutter") so that the text doesn't disappear into the binding. By narrowing the text column, readability is improved. As you can see from the photos, the Personal Size Numbered Edition opens flat, another attribute that aids reading. If you ask me, every book should do this -- certainly every Bible -- and the fact that NavPress delivers this kind of quality at this price point is a lesson to those who think it isn't possible. It is, and is a perfect example. 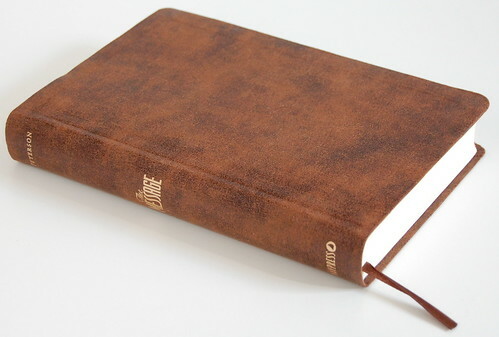 The combination of cover, paper, and binding make this inexpensive edition a real pleasure to use. There's nothing luxurious about it, but it exudes quality. I'm not happy about everything, though. As I mentioned, I had to hunt around for this edition. After discovering the Personal Size text setting, I held off on account of the garish covers. I found the sage green edition at the bookstore and grew very excited -- right up until I found the bizarre inset photo in the middle of the cover. To me, this makes about as much sense as the random two-color designs so popular with the synthetic cover. Instead of a beautifully flexible leather replacement in black, tan or red, we get a Frankenstein hodgepodge of color and texture. It's like finding your dream house on the market at an irresistible price, only to find the previous owners painted elves and gnomes on all the interior walls before ripping out the wood floors to put in carpet. Why, why, why, you ask yourself. 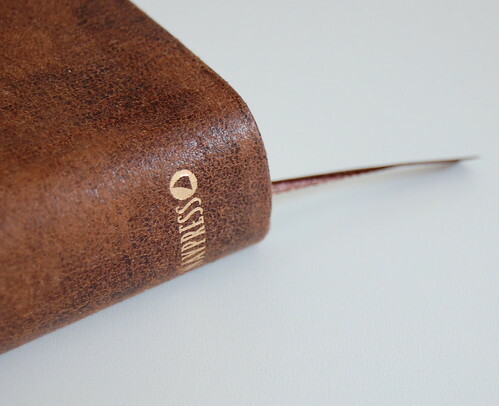 NavPress lists a number of more conservative covers in bonded leather, but I was concerned about flexibility, so I held out for the distressed leather-look option you see here. No, it isn't perfect. But from a distance it reads as brown, and that's good enough for me. I just wish the publishers would offer some bread-and-butter covers without the goofy embellishments. In this regard, I think every publisher should take a deep breath and then shamelessly copy the color and design of the Harper Collins NRSV XL, which is offered in attractive tan, brown and green (Catholic) editions. 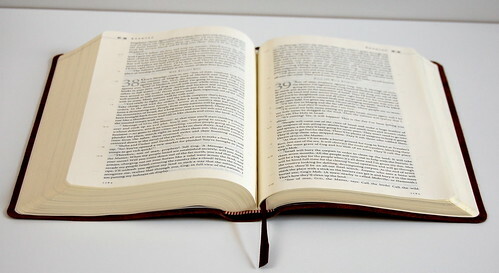 Having said that, I think this edition represents what all Bible publishers should be striving toward. 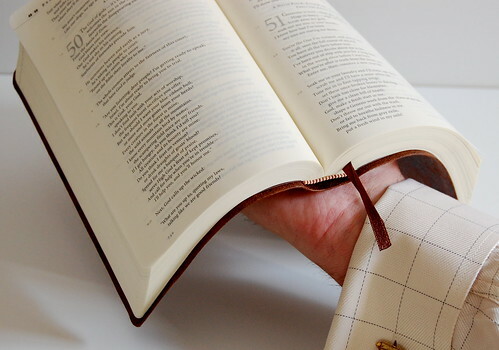 It's a flexible, open-flat Bible with an attractive single-column setting and elegant proportions -- and you can buy one for a very reasonable amount of money. If you use The Message, but you want something more traditional than the Remix hardback, this edition is a real pleasure.